To manage the forums of your discussion tool, click on Manage. Sort the order of the forums. Delete a forum (it must be empty to be deleted. You will be prompted about that). When clicking on “Add” under Manage Forums, any items you had edited on the main screen (i.e. dates, sorting, or check for Lock on Due) are automatically saved. No need to remember to click on “Save” first. To add a forum, click on Add. Add a title for the forum, select the category that it should be listed under. Then, add a description for your forum, dates, forum type and choose if you want it to be gradable or not. The description field is optional, but it can be useful to students. If your description is longer than 250 characters, a “Read more…” link gets appended in the line. When clicking on ‘Read more,’ users can view the full description (and close it) without leaving the page. 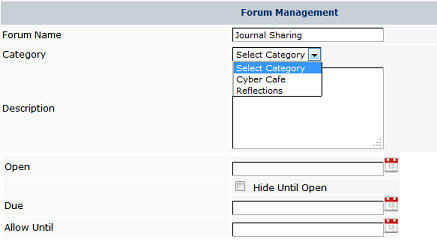 If you include a description in your forum, it will be listed right below the title of the forum topic. To Edit a forum, click on Manage. Then, click on the title of the forum which opens it in edit mode. Save your changes. 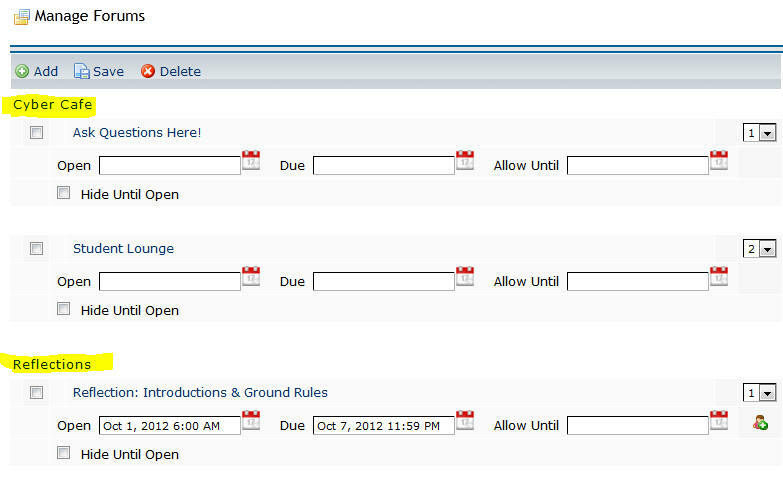 To see your newly created or revised forums, click on Discussion List to return to the student view of the software. The default topic order in Etudes is by “Most Recent”. Sorting discussions chronologically, with the most recent first, allows students to keep up with the latest contributions. However, in formal discussion assignments, a fixed topic order is often preferable. Two additional topic order options are available: By Open Date or By Due Date. They are set under Manage Forum. If the order is “by Due Date” or “By Open Date,” it is applied to all normal topics that have dates, including reusable ones. Announcement and sticky topics are listed at the top, and are not subject to the selected topic order. Topics that don’t have dates are listed below the dated ones, based on the posted date, with the most recent first. Import from site respects the Topic Order setting and brings over the topics in the appropriate order. You can enable starring of posts (similar to ‘like’ of Facebook) in any forum, under the Manage page of a forum. If post starring is enabled, users will have the option to click on a star on any post that they find stellar. The number of users who have starred a post is shown. If a user has starred a post, the star is yellow in their view. Each user can only star a post once. A user can click on the star to remove his or her vote. Import from site retains the post starring settings. Disabling the feature does not remove the data from Etudes. Enabling it, again, will reveal the data. Duplicating a forum can come in handy when instructors set up private group forums, in which students respond to the same set of questions in several forums. You can recreate a forum and its topics with a single click! To duplicate a forum, click on the duplicate icon to the far right of the forum that you wish to duplicate (under Manage Forums). Etudes will create a duplicate copy of the forum with all the gradable and reusable topics that were in it (not replies). The copied topics are exact duplicates of the original (attachments, embedded media, etc.) and have the dates and settings of the original copies (i.e. gradable, sticky, announcement, etc.). The duplicated forum has the same properties as the original, such as category linked to, points, tries, dates, groups, etc. You will need to revise the title of the duplicated forum, and, if it was a group forum, assign the copy to the right group. The duplicated forum has “Copied on date” appended on its title to help instructors distinguish the copied version.